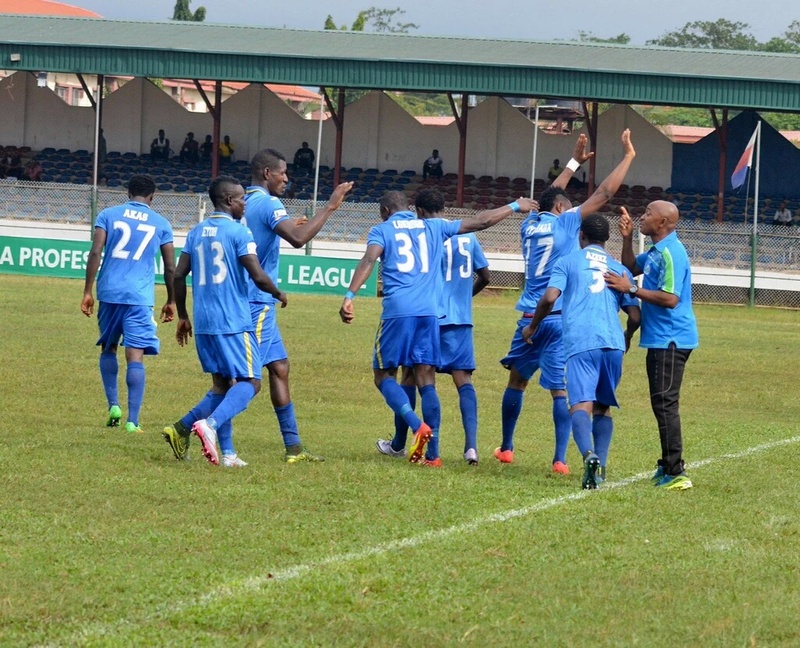 Enyimba 2-1 Warri Wolves: Wolves? What Wolves? 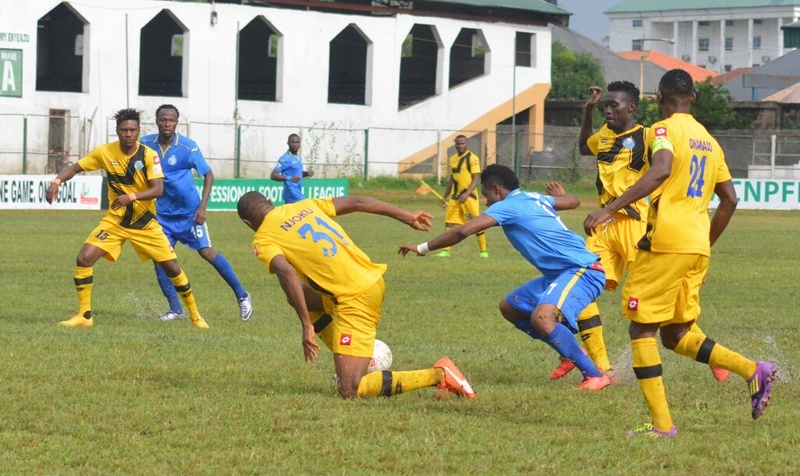 The last time Warri Wolves stood in our way of achieving something of worth, they were unable to hurt us. Just get a goal and win the title for the first time in your history, they couldn’t. OK, we even got reduced to ten men, yet they still couldn’t as much as hurt a fly. I’m not trying to suggest they stopped playing football or anything like that but you wouldn’t blame the fan who believed this would be a stroll in the Park for us. It wasn’t a stroll in the Park, couldn’t have been. Not because of their Oyibo tactician, nor because of their frighten-the-hell-out-of-us squad. But the rains that started to descend just before Kick-off. Our adopted ground Umuahia showed it’s true colours and it was anything but a stroll in the Park for anyone from either side. ‘Police football’ that’s what someone called it on Twitter. Our lineup was pretty much the usual. Just two changes from the Nasarawa win. Dare Ojo who I learnt had gone to Kick start his marriage proceedings was replaced by the man with the craziest hair style at the club, Ifeanyi George. The other change was Christian Pyagbara who hadn’t seen action for sometime following his infamous misses. Well, he showed he merited the nod by scoring what I believe is the fastest goal of the season so far. 54 seconds was just how much time had elapsed between when our visitors got the game underway and when Pyagbara fired us in front. He beat two defenders to curl home his beauty of a goal. Perfect start. You would think we will with our noses infront, go ahead to rip them apart. That would have been the script if the tackles and challenges and the wonderful pitch didn’t make their presence felt. The yellow cards kept coming and you would wonder if everyone won’t get themselves a share. They fought back and got themselves level in the 39th minute but it was an unfortunate goal to concede. Ikeh Thankgod hit thin air as he made to clear the ball, allowing Oghu to level. We would attempt to regain the lead but the goal just wouldn’t come. Their goalkeeper was having a stormer. Grasping, clawing, catching, saving, clearing-off-the-touchline-ing and every other thing he could do to keep scores level. We upped the tempo in the second half knowing fully well that we couldn’t afford anything other than three points. Our front men kept on peppering their goal until the breakthrough arrived. Chima Akas sent a freekick goalward it was spilled onto the path of Andrew Abalogu who got our second, making the game safe. He had just replaced Daniel Etor and all that point, there was no redemption for our visitors. What a potent danger source he’s been- Akas I mean. We saw the game out, bagging the three points at stake and ensuring we hit our highest position so far this season. The result sent us to second place, one point from current League leaders Rivers United albeit with two more outstanding games. The manner of the rise has been nothing short of phenomenal especially when you remember that this is an Enyimba team that has not even played one game at home this term. We’ve played without the backing and visible support of the Enyimba stadium fans. Champions stuff if you ask me. We used to be in 17th place. Eating the junk the guys in relegation places eat. We were away from home and a new squad was trying to familiarize itself with its new members more so in a not too stellar pitch. But we kept making the ascent, learning on the job, learning to trust the gaffer and each teammate and look where we are now. We give God all the glory. Nothing has been won yet but one can’t help but totally love what’s going on in the team right now. The spirit, the results and the belief seeping through this team, the players and the fans also. Our unbeaten run is preserved, 9 matches now. Our rise, steady and surely. We are second place now. We are headed to the very top where we belong. Would it be an exaggeration if we said this is the greatest club this country has ever seen in recent times? I’ll be back tomorrow with some more along these same lines… But enjoy this wherever you are. And one more thing, today is Kingsley Sokari’s Birthday. Show him some love people. May God bless you continually Kingsley. your write up is one sided. I’m an Enyimba fan, well, an Abian what dyu xpect. Beautiful write up. Keep it up! Reblogged this on michaelonyegide's Blog.